Five Of Hearts In Saturn. Destiny Cards Free Reading. You Are In Your Saturn Period! Saturn rules the responsibilities, restrictions and limitations we are apt to encounter, and the lessons we must learn in life. He does not deny or diminish imagination, inspiration, spirituality, or good fortune, but he does demand that these things be given structure and meaning, for he also governs tact, steady thought and serious contemplation. This day is best for healthy dieting or fasting, praying and meditation. The card in this period tells what areas will be affected by the restrictive energy of Saturn. Saturn rarely troubles those who are straightforward, systematic, and above all, patient. Saturn rules sorrow and regret and things connected with the past, for suffering is the doorway to wisdom. The karmic lessons we have come to experience and overcome in this lifetime are expressed by Saturn, the karmic initiator of the zodiac. These are often restriction or oppression in relationships; chronic debilitating conditions in health; old age, poverty and other difficult circumstances in material life. Saturn rules old people, restrictive situations, the common people, the working classes, inflexible authority and chronic, hard-to-shift disorders. The card in Saturn's period reveals the areas of life wherein we must undergo these karmic tests, but good card as four, eight, ten or any crown card is an influence that can bring supreme success. Patience and thoroughness will generally offset the more problematic influences of Saturn, at least in terms of the anxiety they create, because Saturn rarely troubles those who are straightforward, systematic, and above all, patient. 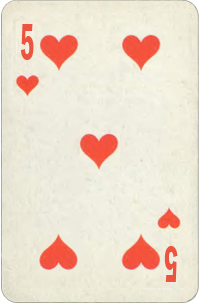 Five Of Hearts Basic Meaning: Feeling of dissatisfaction with your current relationships or home situation. Low side: divorce, separation, trip and moving to a new home. High side: meeting new people, new important contacts.